I had no idea my older cat would hiss when my little one got back from the vet. It's called feline non-recognition aggression and here's what to do. Of all the potential problems I worried about when it came time for my kitten’s spay surgery, bringing her home to my older cat never even crossed my mind. 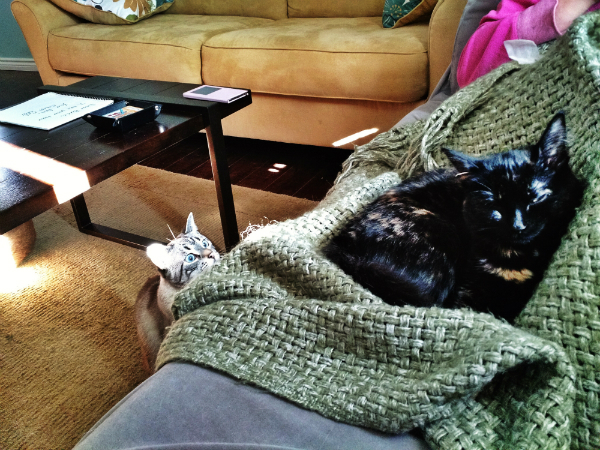 Ever since Specter was a wee kitten, she and Ghost Cat have behaved like peanut butter and jelly — they stick together. Ghost Cat even lets the little one pretend to nurse on her. That’s why I was so surprised by what happened when my husband brought Specter home from her spay surgery last week. I had expected Ghosty to greet Specter with open paws and loving licks, but instead I heard the kind of hissing sound Ghost Cat hadn’t made since the first day she met Specter. It was like suddenly Ghost Cat didn’t even recognize her little buddy — because, I guess, she didn’t. After a little Googling I learned that what Ghosty experienced is called “feline non-recognition aggression,” and it can make the best of kitty friends turn on each other. 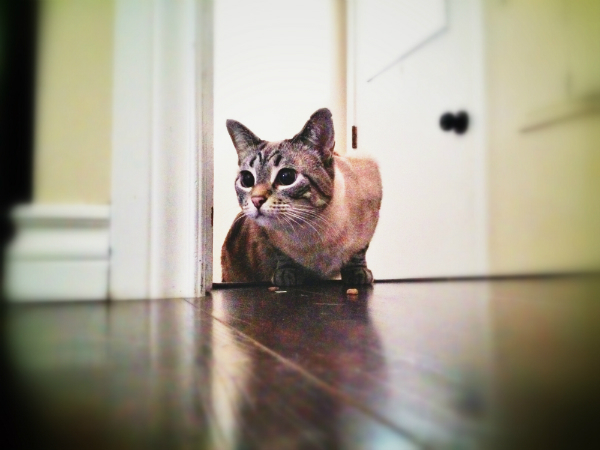 Feline non-recognition aggression isn’t uncommon and happens when one cat in a household comes home from the vet. It makes sense when you look at it from the aggressive cat’s point of view. Their buddy smells different, acts different, and maybe even looks a little different. They don’t know who this imposter is, and so they feel like they need to defend their territory. 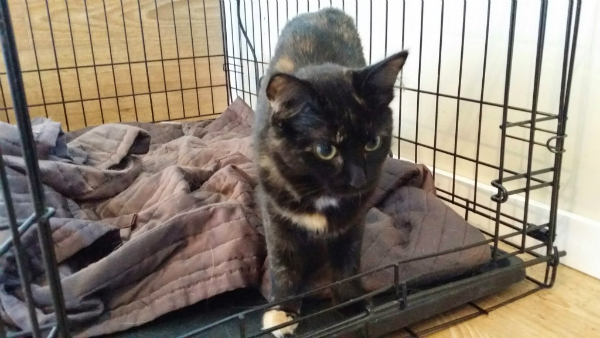 Knowing what I know now, there is plenty I would do differently after bringing Specter home from her spay. Going forward as a cat mom, I plan to use the following tips whenever one of my kitties is returning home from the vet. When my husband brought Specter home from her surgery we opened up the kennel right away, with Ghost Cat watching from the top of the stairs. That’s when Ghost Cat started hissing, surprising all of us — especially poor baby Speck. I now know that springing Specter from her kennel so quickly was a total mistake. According to the American Association of Feline Practitioners, a returning cat should be left in their carrier for a few minutes when they get home from the vet. That way the humans can see how other cats in the household are going to react, and proactively prevent conflicts. If we hadn’t let Specter out so fast we would have had the opportunity to see how uncomfortable Ghosty was, and we could have moved Specter to another room while she was still protected in the kennel. We never should have brought the cats back together until Specter (who had slept over at our vet’s office) stopped smelling like medicine and other animals, and until she was done with the pain medication that made her move slower than normal. If I had kept Ghost Cat downstairs until Speck started smelling like herself again, maybe Specter would have been greeted with kisses instead of hisses. Instead, we let Ghost Cat stick around (at a distance). We thought we were safe to let her hang out across the living room from poor little Specter, until Ghost Cat suddenly jumped up on the couch and took a swat at poor Specter. When Ghost Cat started getting nasty, my husband and I started coming up with a plan B for Specter’s recovery, as she certainly couldn’t be expected to share common areas with this evil-twin version of Ghost Cat. 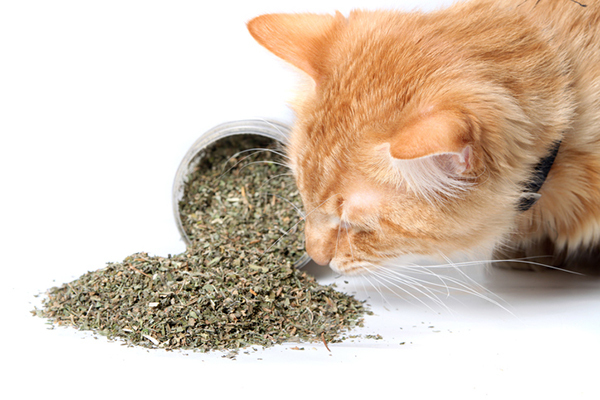 The American Association of Feline Practitioners recommends placing food, water and a litter box in a separate room for a minimum of 24 hours while the retuning cat regains the smell of home. In Specter and Ghost Cat’s case, we did not wait the 24 hours. 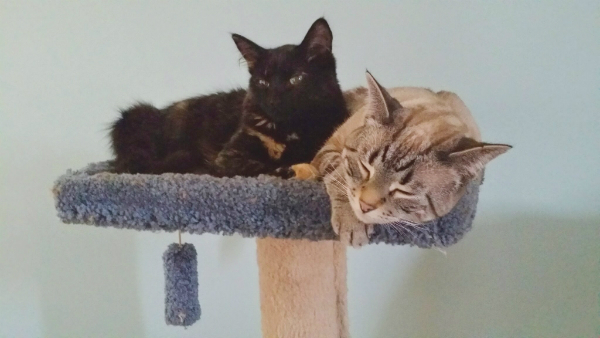 While my husband and I made plans to quarantine Specter in an upstairs bedroom overnight, we ended up scrapping that plan when the two kitties mended their friendship through a slightly cracked door. This was the one thing we did right — although we did it too late to protect Speck from a traumatic homecoming. After thwarting Ghost Cat’s earlier attempted attack on Specter, the little one and I retreated to my bedroom for a nap. When we woke up my husband and I decided to see if Ghost Cat was still freaking out, so we opened the basement door just a crack. Specter, who had followed me from the bedroom to the kitchen, went right up to the door to see Ghosty. Maybe some of Specter’s vet smell had worn off while we were cuddling in my bed, because Ghost Cat did not react violently to seeing the younger cat this time. It was almost as if nothing at all had happened. After a couple minutes of both cats peering calmly through the cracked door, we opened it all the way and let them love on each other. 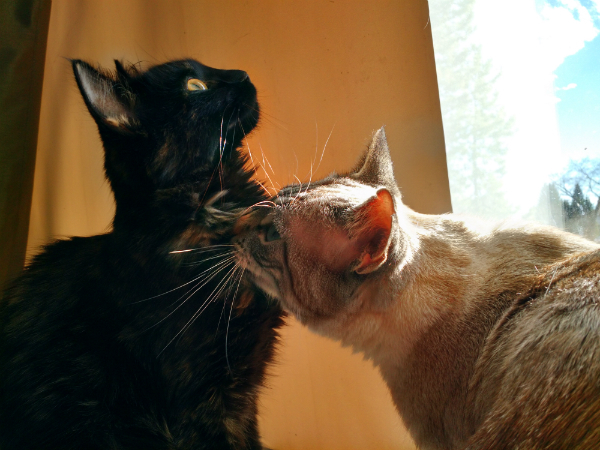 This tense period in their relationship started at 9:30 in the morning, and by two o’clock in the afternoon they were up on the couch grooming each other and pretending to nurse. I am so pleased that Specter’s post-spay homecoming eventually had a happy ending, and I have certainly learned from my mistakes. The next time either of my girls makes a trip to the vet, they will be having a full day of separation before being brought back together again. Has one of your cats ever turned on another who returned from the vet? How do you handle feline non-recognition aggression? Let us know in the comments. Ask a Vet: Should You Bring Your Kids to Your Cat’s Vet Visit? Can Vets’ Offices Be More Cat-Friendly? Have You Ever Felt the Need to Break Up with Your Vet?